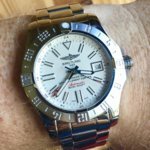 Hey guys, I just approved my QC on the GF Breitling avenger ii GMT in stratus silver (white) dial. I’ll be posting a review and opinions on this when it arrives. 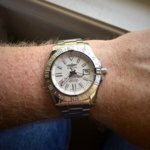 Pretty much all comments on this watch from other forums are that it is a fantastic rep and I can’t wait to find out. I’ll keep this thread going with wristies and relevant updates, but for now here is a quick side by side of the gen vs rep. Arrival day! Took a bit longer than expected with the holidays in China... but it’s here. Very nice. Congratulations! Thanks for sharing. So far I am loving this watch. It is extremely solid and well built. The bezel clicks with a satisfying solidity befitting a far more expensive watch. 5 digit Rolex’s have nothing on this. The time and date setting actions are precise, feel good and sturdy when turning. The only minor niggles I have encountered so far are that the crown threads closed a little rough, but I think a wipe down and some silicone grease will solve the issue. Second you have to be very deliberate when closing the clasp. Making sure to fully engage the main clasp before flipping over the safety lock other wise it has come open, but only after I open the safety catch. Once it’s fully closed it’s very solid. 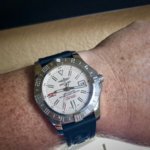 I purchased a breitling ocean racer rubber strap and deployant buckle to try it out and it is great. It changes up the feel of the watch making it much more sporty and less formal than the highly polished bracelet. How is the thickness? I have tried Breitlings a lot in the past, but end up dropping them because they feel bulky to me. This is pretty thin for a breitling. It lays flat on the wrist and is not top heavy at all. I’m going to do a full set of caliper measurements for the dimensions as soon as I have a minute.